What especially jumps out is the fact that Skip accounted for 90 percent of all rides. 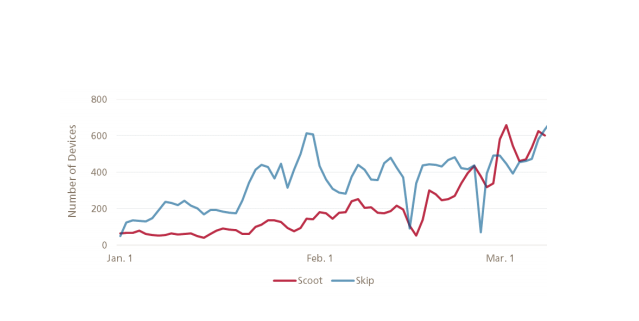 It seems that’s a result of consistently having more scooter availability than its rival, Scoot . Oh, and here’s the real shocker (sarcasm): 63 percent of riders are white and 82 percent are men. Meanwhile, 68 percent of the riders have household incomes of more than $100,000, according to rider surveys. In San Francisco, 53 percent of the population is white and 51 percent are male, according to the U.S. Census Bureau. Update 12:50pm PT: The SFMTA has decided to allow Skip and Scoot to add an additional 175 scooters to their respective fleets. As part of that, each is required to sign up at least 150 riders as part of their low-income programs. Once they hit at least 500 low-income riders, the companies can deploy a total of 2,500 scooters.